With news that Nintendo’s retro box the NES Classic managed to outsell flashier current-generation video game consoles over the summer, it’s clear that video game nostalgia is all the rage. If that love for old Nintendo games has hooked you as well, then you’re going to want to meet Athens group Bit Brigade. Adopting conventional rock instruments to meticulously rework classic 8-bit NES soundtracks, the group’s show is essentially a real-time soundtrack to a live speed run of a classic game, projected behind them. For their return to at Exit/In tonight, Nov. 6, the band will tackle both Mega Man II and Castlevania (after bringing their The Legend of Zelda show to town earlier this year), with local kindred spirits The Mad Gear, and art metal outfit Edge of Reality. This show definitely has a particular niche, but if it’s your niche, it’s seriously a performance not to miss. Grab tickets here, then read on for more about the show! Over the last maybe decade or so, video game music as a live performance medium has grown from incredibly niche to borderline mainstream (take, for instance, Nashville’s own beloved Mega Man inspired rockers Protomen, or ever-prevelant influences in electronic-infused artists like Grimes, or even video game themed symphonic tours of major classical venues). And, while many chip and glitch purists have found ways to use modded game systems, computers, and electronics to craft music entirely from retro tones, another whole subset of acts have carved out a style using more traditional rock instruments to reinterpret video game soundtracks and styles. Athens, Georgia’s Bit Brigade fall into the latter camp, but with an incredibly cool twist: the band, made up of some supremely talented shredders from other Athens area acts, meticulously work classic game soundtracks (almost entirely NES), which they put out as formal releases, but their real bread and butter is their live show, which involves expert retro gamer Noah McCarthy performing speed runs of games projected on a screen, while the band provide a live, dynamic, and perfectly-synced accompanying soundtrack. It’s an impressive, technical, and gloriously nerdy feat, and if you’re someone who enjoys watching retro speed runs (a whole cottage entertainment industry in of itself) and/or enjoy full-band reimagining of 8-bit tunes, Bit Brigade’s Mega Man II and Castlevania show at Exit/In is going to be an experience to remember. Like Bit Brigade, Nashville’s The Mad Gear are a video game band who eschew the chip and glitch trend to craft music with more traditional instruments (even incorporating brass and woodwind into their impressive, eclectic sound). Though they have done covers, the group, even more impressively, have largely stuck to taking the retro game sound tradition and crafting original tunes from it, providing soundtracks to their own short film and free, online old school beat ’em up game. Essentially, if Bit Brigade caught your interest, you’ll love The Mad Gear too. While not a video game or 8-bit infused band, locals Edge of Reality should nonetheless appeal to fans of the rest of this bill. The brainchild of Joey Frevola of Kyros, the genre-bending project classify themselves as art metal, and with a handful of releases over the past few years, have explored a wide range of textures, and ambitious and thought-provoking themes. Show up early and see what they’re all about! 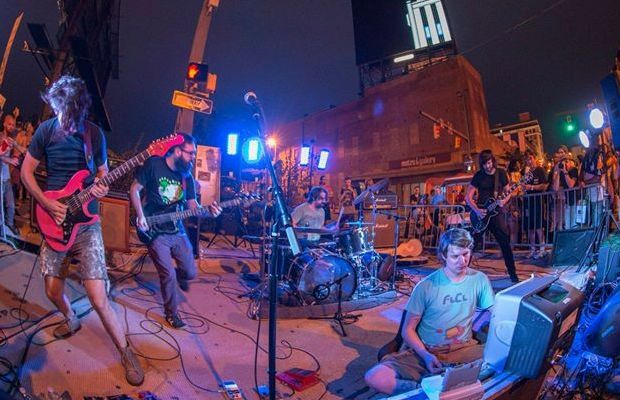 Bit Brigade, The Mad Gear, and Edge of Reality will perform tonight, Nov. 6 at Exit/In. The show is 18+, begins at 8 p.m. (doors at 7 p.m.), and tickets are available to purchase for $15.